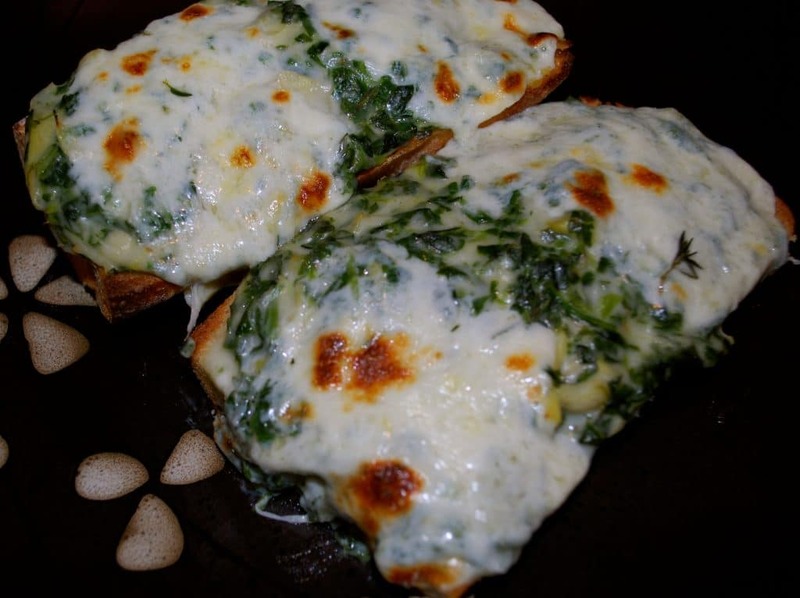 These Spinach Artichoke French Bread Pizza’s make for a tasty meatless weeknight meal. The topping can also be used for a dip as well! If you’re like me, by Friday night I’m usually wiped and don’t want to fuss over a big dinner. The girls are usually coming and going (as their social calendar has taken precedence over mine at this point) and hubby is still working late. So I like to make things that are fast, easy and can be reheated quickly. 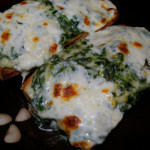 A few years ago I found a recipe in Rachael Ray Magazine for these Spinach Artichoke Pizzas and as I was flipping through my recipe box looking for cookies last week, this one popped out (if you don’t remember, my hubby accidentally dropped my recipe box a few months ago and who knows what you’ll find in each category now!). I figured I’d give it a try. I didn’t follow her recipe exactly but the premise was still there. These were incredible AND I think I found a new way to make Artichoke Spinach Dip too because this way was even better than the way I had made it previously. ~Enjoy! Cut the bread into four sections, then slice horizontally, creating eight halves. In a medium saucepan, melt the butter and add the garlic. Stir until the flavor of the garlic starts to release then add the flour, forming a roux. Reduce heat to low and add in the milk, both cheeses, and the ground pepper. Whisk together until all of the cheese has melted and the sauce becomes thick. Add the artichokes and spinach and mix until well blended. Portion the sauce on top of each bread half and top with 2 slices of fresh mozzarella and thyme. Bake at 425 degrees for about 10 minutes, then broil for 2 minutes to get the cheese browned. Yes please!!! I wish I had this in front of me now 🙂 Spinach and artichokes are such a wonderful marriage. Thank you Melissa and Corey, it really was very tasty!